Mothers Day is usually about moms to people. Yeah, I understand why and it is called mother's day and all. But let't get real there is more than one person in our lives who deserve a shout out... at least there is in mine. 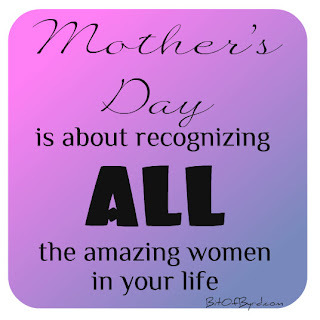 So today, like I am sure many other bloggers are doing, this post is for those amazing women. My Mom. I wouldnt be here without you. HA. Couldnt resist. Thanks mom for always doing your best and allowing me room to figure out who I am. Aunt B. You dont have to be as involved as you are but you choose to. Thank you for always being there and being supportive in decisions I have made. Grandma. You taught me how to sew a button and how to make bisquits. You taught me an interest in painting and crafts. I wouldnt be who I am today without you. My Aunts. AK, AA. You guys keep life interesting and I know when the rubber hits the road you are behind me 100%. Sisters. Brooke and Apryl. Apryl, my life is ever entertaining with you in it. You are smart and witty and always see the best in me. Brooke, you are so positive and knowing you makes my life better. Cousins. Theresa, Marisa, Michelle, Summer. Life has been a ride. Tears, Laughs, Lemonade Stands, Fashion Shows. I am excited for the one day weddings and baby showers that will down the road. I am so proud of the women you all are. Ms Arens. She doesnt read my blog but she is an important person in my life. She is a caring ear to listen to what is going on and is ever interested in any and every drama of my life. LeeEllen. Stake outs, Taco Casa, Snow Cones and tough times only scrape the surface of some of the adventures and things we have been through together. Thank you for being you. Brittany. Sometimes I think you are supermom! Your heart is so big and you are a great mom and I am glad we got back in touch after high school because life without you was kinda dull. Gabby. Some people are with you forever. You have forever changed my life even though yours ended too soon. I think about you often and your memory keeps me grounded in living in the present because tomorrow is not guaranteed. Deb. You are a motivating force. You are constantly positive and I appreciate that you dont give up on me. YOU! So many of my readers are women. And the people I follow on Twitter and I dont want to try and name you because I will leave someone out but know that your comments and your tweets often make me laugh. I love starting my day with positive, uplifting tweets and love hearing from you all. I am proud to have so many strong women to stand beside me and with me through anything life throws at me. I know that even when life is at its worse I have the best people ever standing with me. Thank you to each of you for the role you play in my life and know that my life is ever changed by each of you in it's own way.